Despite the heat and limited space, words cannot express how the band and our management team appreciate everyone (around 400 people) who cramped inside 70s Bistro to join us in this celebration of music. We dedicate this comeback to all true fans of O&L. Thank you for the warm acceptance in spite of being a trio, the technical glitches and occasional blunders. We are still feeling our way with our old songs and as a performing unit. Many traveled from far places. We are deeply sorry to those who queued but can’t get in. We will be announcing a 5 city bar tour within the Metro for the month of October so we can be near where you are. To old and new faces, thank you for singing along, for making us feel a decade younger and still relevant. We love you dearly! Special thanks to our partners and sponsors: Lilystars Records, Darkus Music, JAM 88.3, MYX Philippines, Loyal Clothing, David’s Salon and Grab PH. 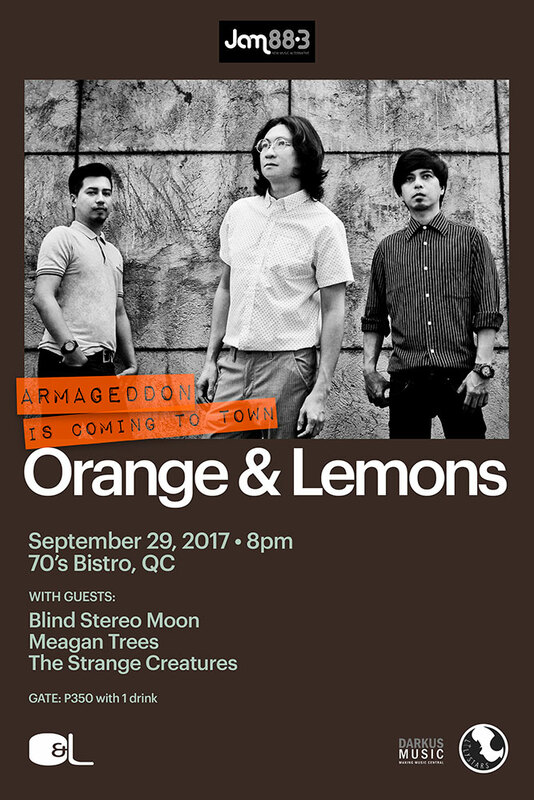 To other media present: Philippine Star SUPREME, MB Life, GMA News, PULP Magazine, U Do U, Rick Olivares, PJ Caña, etc; To Jof Nachor and his 57 Studio team for covering the show; To Rain Paggao, our superb live session guitarist for making us sound whole; to the excellent bands/musicians who played: Blind Stereo Moon, Meagan Trees and The Strange Creatures; to the iconic The 70’s Bistro…. THANK YOU! From L-R: JM Del Mundo, Clem Castro and Ace Del Mundo. Photo by Angelo Maniquis. It’s been almost 10 years now. We badly miss the music so we decided to add a new chapter in the band’s short history. We have officially reformed Orange & Lemons as a trio to continue where we left off. This is not some fancy reunion, but a decision to protect the legacy of the band and the songs that many of you know and have grown to love. New music is on the horizon and we promise to stay true to the sound we are known for with a clear-cut independent direction. We feel good at the prospect of playing our modest catalog for you in the coming months. Until then.